Just as Chester's history has been linked with the River Dee, so it is with the Chester Tour. The bus crosses the Dee by both the Grosvenor and Old Dee Bridges and at The Groves provides a convenient connection with the river cruises operated by Bithell's Boats - take advantage of a combined Bus & River Cruise Ticket. Visit Frodsham Street where shopaholics will find both the Mall and Grosvenor Shopping centres. The Forum Shopping Centre and Markets are also worth a visit. Discover the site of the ancient Amphitheatre where the partially-excavated ruins of the largest stone-built Roman military remain. To feed your appetite for history further, visit the award winning Dewa Roman Experience where you can enjoy wandering through Roman Streets, explore archaeological remains and handle ancient relics in a hands-on studio or hop off at the Grosvenor Street Museum. Hop off at the Racecourse or County Hall & Castle. Or travel through three centuries of Cheshire history at the Cheshire Military Museum which highlights the history of four famous Army Regiments connected with the County of Cheshire from 1685 to the present day. 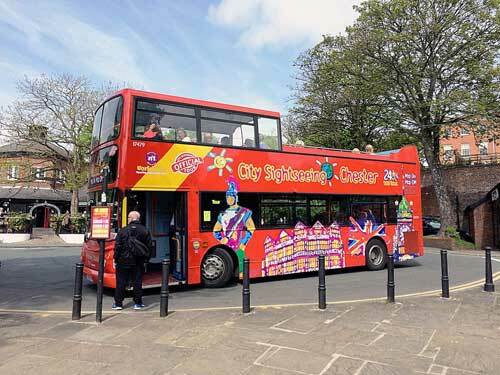 Let City Sightseeing highlight all there is to see and help you plan your stay in the city. In the evening you may want to unwind in chic and trendy bars which serve award winning cocktails and champagne. Perhaps you might want to dine on delicious a la carte meals or discover the city’s real ale pubs and cosy bistros. Also on offer are clubs, live entertainment and ten-pin bowling. For something a little different, try an evening cruise on the river - good food, great music and an unbeatable view!